Commuters say the partial closure of a busy road will be "absolute mayhem" and a "nightmare". 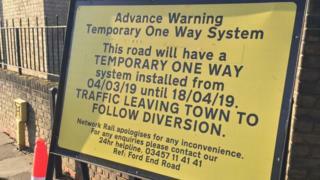 From 4 March, Bromham Road Bridge, on the A428 in Bedford, will be shut for traffic travelling out of town. It is being demolished and reconstructed as part of the continued electrification of the Midland Main Line to Kettering and Corby. A spokesman for Network Rail said it would be a "challenge" but would improve passenger journeys. The road will reopen on 18 April, but will close completely at a later date to allow the height of the bridge to be increased so overhead power lines can pass underneath. Dr Barry Monk from Bedford said: "It will cause major disruption, it will be absolute mayhem. "The electrification could be absolutely fantastic but it better be jolly good indeed to make up for the misery people are about to be put through." Bill Bruster, who lives near the bridge, said: "There's no way round it, they have to rebuild the bridge. As much as it's an inconvenience, I can't see anyway round it." However, local resident Ken Tyso said the "essential work needs to be done", but said one of the answers was to use the town's bypass and avoid the area. Underground services running through the bridge will be taken away and moved, before it is demolished and rebuilt. A temporary footbridge will be built for pedestrians and cyclists. Network Rail has not said how long the work will take, but says it will be completed by 2020. A spokesman said: "It is a major artery into the town so it was always going to be a challenge for us". It would bring "passengers tangible improvements to their journeys", he added.